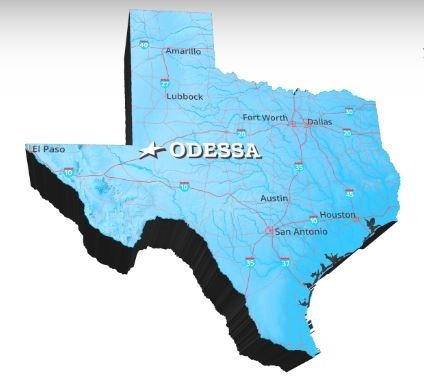 A small entrepreneurial start-up developing a high temperature gas cooled reactor (HTGR), based on the design work of the pebble bed modular reactor (PBMR), is looking for a site to build a test bed for its technology in the Odessa, TX, area. X-Energy sent company representatives to the area last week who met with a team from the University of Texas Permian Basin (UTPB) and the Odessa Development Corp which serves Ector County, TX. According the local news media reports, Eben Mulder, X-Energy’s Chief Nuclear Officer, said his firm is hoping to pull together academic and community resources to create the basis for building a test facility for its Xe-100 HTGR. UTPB has a newly developed nuclear engineering program that could work with the company on the reactor design and test program. The Xe-100 at full commercial scale is expected to be able to generate 80 MW of electricity and provide 200 MW of process heat from extremely hot helium used in the reactor. X-Energy plans to offer the reactor to customers in configurations of four units each. Last January the U.S. Department of Energy (DOE) awarded X-Energy a $40 million grant. The firm has also invested $13 million of its own money. More recently, it partnered with Southern Nuclear with also has a $40 million grant from DOE to conduct work on design of a molten chloride salt reactor MCSR). What is common to both the HTGR being worked on by X-Energy and the MSR being developed by Southern Nuclear is that they use TRISO “pebble bed” fuel which was developed for the PBMR work in South Africa. Several of the key technology executives at X-Energy are veterans of the PBMR project. While no formal commitments have been made by the parties involved, the enthusiasm for the effort, expressed by the parties in the talks, embodies traditional Texas values that the effort will be a very big deal. Jim Write, UTPB’s director of economic development, expressed enthusiasm for the X-Energy project. He said the firm could be expected to spend more than $1 billion on development of the Xe-100 including a test and demonstration facility. A Canadian company developing a integrated molten salt reactor (IMSR) has landed a new round of Series A funding. The $4 million added to previous funding raises the total in Series A funding so far to $17.2 million. The funds are being used to develop a commercial implementation of the IMSR which is based on a design originally developed at the Oak Ridge National Laboratory (ORNL) in the 1950s. Unlike conventional light water reactors, the IMSR uses a liquid fuel suspended in a hot liquid salt medium, which doubles as the coolant, and which operates at atmospheric pressure. The firm is reportedly working with the Canadian Nuclear Safety Commission to conduct an assessment of its technology relative to the agency’s safety standards. In March 2016, Terrestrial Energy announced a grant award of CAD $5.7 million from the Canadian Federal Government’s Sustainable Development Technology Canada’s (SDTC) SD Tech Fund. The source of the latest investment was not disclosed by the company. The firm is targeting having a design ready for customers in the 2020s. A firm that operates a uranium enrichment plant in southeastern New Mexico is developing a 4 MW HTRG that will use TRISO fuel enriched to 19.2% U-235. Fuel Cycle Week (FCW) publisher Andre Jennetta reported the development in the September 8, 2016, issue of the industry newsletter. According to the FCW report, Urenco’s work is in its initial phase of design. According to the company’s website, Urenco has initiated talks with potential technology partners and investors in Poland, Japan, and the UK. The firm’s technology executives have significant experience with work on small modular reactors. The company reports on its website that in May 2016 it announced the agreement of terms with the National Centre for Nuclear Research (NCBJ) to cooperate for the deployment of U-Battery in Poland. Agreement was reached and a Confidentiality Agreement was signed during the visit of the Polish Undersecretaries of State for Energy, Andrzej Piotrowski and Michal Kurtyka, to the United Kingdom on 24-25 May, accompanied by other senior officials from the Polish Ministry of Energy. In July Urenco team members conducted a working level meeting with officials from the Japan Atomic Energy Agency. Urenco is also targeting the SMR competition for $250M in the UK.